One trillion dollars and rising. That's a big number and it belongs to poor college students. In 2012, 70% of graduating students had loan debt at an average of $28,400. One source of the problem is the cost of a college education has far exceeded inflation. In 1974, in 2014 dollar, the cost of tuition, fees, room and board was $7,938. It is now at $18,943. Student cannot work their way through college anymore forcing millions of students to take on exorbitant amounts of debt. Low-income students struggle to complete degrees. Only 32% of college students from the bottom quarter of income distribution complete their bachelor's degree. We recently wrote on the value of a college diploma. But now we look at costs. What has changed with higher education? Why is a college degree becoming more of a dream than a reality for American students? From 2000-2010, the median salary for administrators at public universities rose approximately 40% while full-time professors saw an increase of 20%. When you look at the bigger picture, the number of administrators rose 370% between 1978 and 2014. In a recent controversial New York Times article, the author outlines that money from state government is at its highest yet. And although colleges now have more students, money from the state is not going to professors. Since 1970, the salaries of full-time faculty have remained fairly steady. Also, since 1970, the percent of full time professors has dropped from 78% to 50%. Benjamin Ginsberg, a professor at Johns Hopkins University, has also pointed out that in the past four decades, the number of students to "full-time equivalent" professors has remained constant. However, also in the past four decades, the number of administrators has grown 85% and administrative staffers is up 240%. Colleges do a lot to attract prospective students. Just look at Long Island University where all students get iPad minis. At MIT, students are treated to game consoles, huge movie screens, and even a giant ball pit. UC-Davis resident halls all have their own swimming pool. Tulane University offers free massages to their students. The list goes on. It is now easier than ever to get student loans. It also easier to delay payment. This helps students "push student loans down on their list of bills to pay." However, delaying payment still racks up interest increasing debt payments. Students fresh out of high school also often fail to see the huge consequences of student loans. 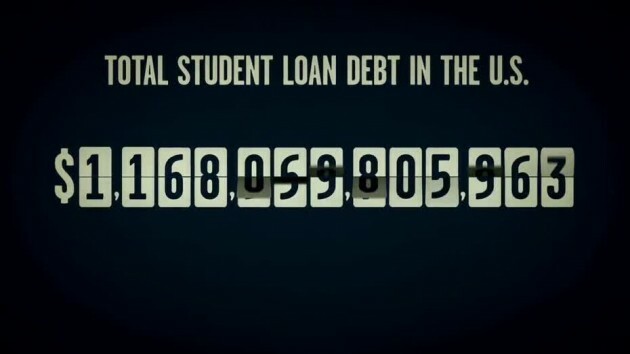 As a result, more students take out loans adding the trillion dollars now owed. We here at USDemocrazy invite you to our viewing of Ivory Tower Thursday April 23rd. View the trailer here. The movie discusses the high cost of college, the value of a diploma, and the future of higher education in the United States. What’s the Verdict on Obamacare? Research on this question by economists and others makes clear that the most important factor behind this trend is the decline in per-student funding from states. More than 75% of college students are enrolled in public colleges and universities, where the revenue from general funds has declined markedly (e.g. from $16,400 to $7,500 in California between 1990 and 2010). While the short list you provide is provocative, it ignores the elephant in the room.